A two-step state-dependent analysis model corresponding to the flow state before gelation and the viscoelastic state after gelation was proposed for the prediction of the residual stresses developed in polymer matrix composites (PMCs) during cure. The evolution of the viscoelasticity of PMCs during cure was analyzed based on the non-dimensional viscoelasticity parameters 1/Dem, and the gelation time was determined at the condition of Min(1/Dem) = 102. 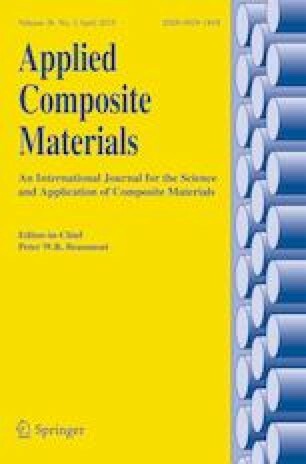 The proposed model was used to predict the process-induced residual stress and distortion in a thick semi-cylindrical composite shell. By comparing the predictions with those of the original cure-dependent viscoelastic model, the proposed model was verified and the computing time and memory storage were significantly reduced. The results show that during the cure of thick semi-cylindrical composite shell, the residual stresses caused by the cure shrinkage at high cure temperature are quickly relaxed, and most of the residual stress develops during cool-down. The spring-in deformation of the semi-cylindrical shell when release from the mould is mainly caused by the significant hoop stress gradient in the thickness direction developed during cure. Obvious warpage is not present in the composite semi-cylindrical shell due to the high bending stiffness. This work was supported by the Fundamental Research Funds for the Central Universities of China under Grant No. 2018IB004.